Background and objectives: Poor hypertension control observed in patients with chronic kidney disease (CKD) may in part be due to the suboptimal assessment of BP with clinic BP measurements alone. The goal of this meta-analysis was to estimate the prevalence and determinants of white-coat and masked hypertension in the adult CKD population. Design, setting, participants, & measurements: Articles reporting prevalence of masked and white-coat hypertension in patients with CKD were obtained from two major databases. We then performed a meta-analysis to derive pooled estimates of prevalence and determinants of these two conditions. Results: Among 980 patients with CKD identified in six studies, the overall prevalence of masked hypertension was 8.3% and of white-coat hypertension was 18.3%. More alarming, 40.4% of patients who had CKD and were thought to have normotension (or adequately treated hypertension) in fact had hypertension at home. Also 30.0% of patients who had CKD and were thought to have hypertension had normotension at home. The thresholds for classification of clinic and ambulatory BP as hypertensive strongly influenced the risk for diagnosis of masked hypertension in favor of white-coat hypertension. Conclusions: Because clinic BP measurements alone lead to substantial misclassification in BP, we estimate that the prevalence of poorly controlled hypertension is likely less than currently estimated. 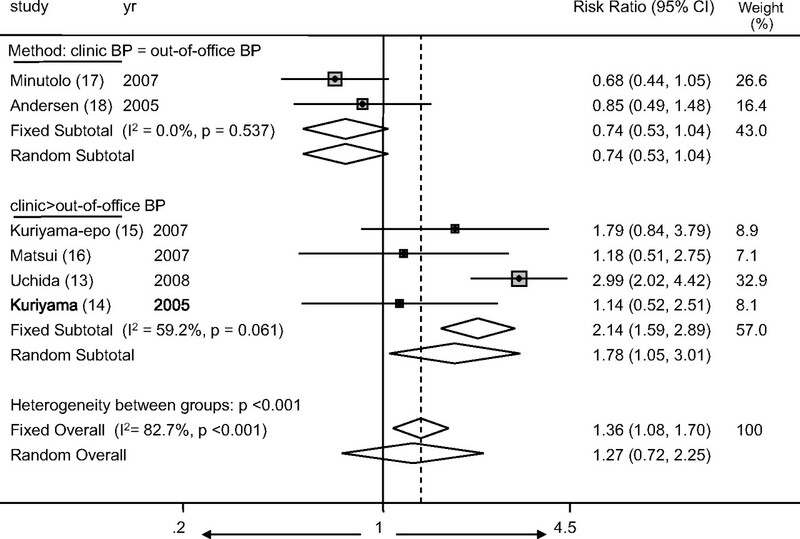 Out-of-office BP monitoring may improve the management of hypertension in patients with CKD. Standardized definitions for the diagnosis of masked and white-coat hypertension would facilitate research. Prevalent in 80 to 90% of patients with chronic kidney disease (CKD) (1), hypertension is widely known to accelerate progression of CKD and increase the risk for cardiovascular events (2). Despite the recommendations for stricter BP control in patients with CKD (<130/80 mmHg) compared with those with essential hypertension, only 27% achieve a BP goal of <140/90 mmHg, and even fewer (11%) reach goal BP of <130/85 mmHg (2). A major reason that approximately 90% of patients with CKD are unable to achieve goal BP is because of volume overload as well as activation of numerous mechanisms as a direct result of underlying kidney disease, which makes BP resistant to control with antihypertensive drugs (3); however, often ignored is the consideration that hypertension may seem to be poorly controlled because of suboptimal BP assessment. Automatic ambulatory BP measurement and self-measurements of BP allow not only a greater number of measurements but also because BP are sampled in the patients’ natural environment make these measurements more valid. In fact, numerous studies have documented that self-measured or automatic ambulatory BP is prognostically superior (4,5). It is now possible to measure discrepancies between clinic-recorded BP and ambulatory BP readings to define characteristics of hypertension that are dependent on the location of BP measurement. A widely known condition is white-coat hypertension, defined as elevated BP in the clinic but a normal ambulatory BP (6). Somewhat less recognized but potentially of great importance is the discovery of patients with higher BP on ambulatory BP monitoring (ABPM) compared with clinic BP; this condition is called masked hypertension, a term coined by Pickering et al. (7). If the likelihood of white-coat hypertension is greater than the likelihood of masked hypertension, then the true prevalence of poorly controlled hypertension may be lower. Location-dependent hypertension (masked hypertension and white-coat hypertension) is not simply a statistical quirk that may influence the estimates of true prevalence of poorly controlled hypertension. Location-dependent hypertension informs the prognosis of patients with hypertension (8,9). In the general population, people with white-coat hypertension have a more benign prognosis than individuals with true hypertension, and people with masked hypertension have worse outcomes compared with people with true normotension (10). In the CKD population, patients with masked hypertension are more likely to progress to ESRD and die (11). Thus, estimating the prevalence of masked hypertension and white-coat hypertension is of epidemiologic as well as of clinical importance. Accordingly, the goal of this systematic review was to estimate the prevalence and determinants of white-coat and masked hypertension in the adult CKD population. We searched the PubMed database with the terms “masked hypertension” and “kidney disease.” In addition, we searched using MeSH terms “kidney failure, chronic,” “masked hypertension,” and “white-coat hypertension.” Keywords used were “masked hypertension,” “reverse white coat hypertension,” “renal disease,” and “chronic kidney disease.” We also searched the OVID/MEDLINE (1950 to present) database using the subject heading terms “kidney failure, chronic,” “hypertension,” and “prevalence.” Keywords used were “masked hypertension,” “chronic kidney disease,” and “white-coat hypertension.” We restricted our search to humans. To be included in our study, studies had to report the prevalence of masked hypertension or provide enough information to calculate this, and methods of BP measurement needed to be clearly noted. In addition to this search, we manually reviewed references cited in our retrieved articles and review articles. Our medical librarian did an additional search to ensure completeness. Only one article obtained was not in English and judging by abstract was not included because it was not relevant. All data were abstracted with a standardized data collection form by both authors. From each article included, we abstracted the study design, year, number of included patients, age, gender, race, body mass index, alcohol use, smoking status, diabetes status, hypertension treatment status, cholesterol, proteinuria, estimated GFR, prevalence of masked hypertension, white-coat hypertension, and normotension and sustained hypertension in patients with CKD only. Proportions of patients and the exact binomial confidence intervals (CI) were calculated. Using the inverse of the SE of these proportions, we pooled the prevalence between studies with a fixed-effects model. For the sake of comparison, random-effects models are also reported. We used Forest plots to visualize the extent of variation between studies and the I2 statistic to quantify heterogeneity between studies. I2 values that range from 0 to 100% describe the proportion of variation in prevalence estimates that is due to between-study variation rather than sampling error (12). We obtained the group-specific and overall I2 as standard output of the metan program. All analyses were performed by metan command of Stata 10.1 (Stata Corp., College Station, TX). The impact of single studies on the overall pooled estimates was calculated using metaninf program also in Stata 10.1. A total of 54 studies were obtained from our search, six of which were of adults with CKD and used for analysis (13–18). The reasons for exclusion are shown in Figure 1. Inclusion and exclusion diagram for articles that finally were selected for meta-analysis. The total number of patients with CKD from all studies was 930, and range of patients per study was 48 to 290 (Table 1). In four studies, all patients had CKD (14,15,17,18), whereas the other two studies (13,16) defined the percentage of patients with CKD. In three studies (13–15), all patients were treated with antihypertensive drugs, in one study none of the patients were treated with antihypertensive drugs (16), and in two studies (17,18) mostly treated patients (approximately 90%) were included in the study. Four of the studies used self BP monitoring (13–16) and two studies (17,18) used 24-h BP monitoring as the reference standard. The prevalence of masked hypertension from the individual studies ranged from 4.7 to 31.3%. The average weighted prevalence from all studies was 8.3% (95% CI 6.6 to 10.0%; Figure 2). Among patients who had normotension on the basis of clinic BP, the prevalence of masked hypertension was 40.4% (95% CI 35.1 to 45.7%). There was substantial heterogeneity between studies (I2 statistic 83.7%; Figure 3). The study of Uchida et al. (13) was statistically influential in inflating the prevalence estimates, and omitting this study reduced the prevalence of masked hypertension among those who had normotension in clinic to 33.0% (95% CI 25.5 to 40.5%) and also reduced the between-study heterogeneity (I2 statistic 53.8%). Forest plot shows the prevalence of masked hypertension. When studies were divided on the basis of the criteria used for diagnosis of masked hypertension, it was found that studies that used a more strict criterion (clinic systolic BP <130 mmHg, ambulatory BP ≥130 mmHg) were less likely to find masked hypertension, compared with studies that used a more liberal criterion (clinic systolic BP <140 mmHg, home BP ≥130 to 135 mmHg). 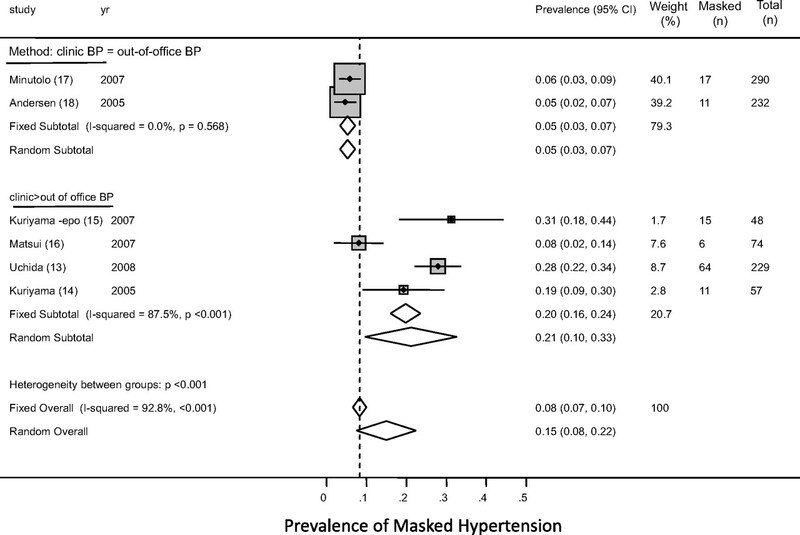 Forest plot shows the prevalence of masked hypertension among patients with normal BP in the clinic. When studies were divided on the basis of the criteria used for diagnosis of masked hypertension, it was found that studies that used a more strict criterion (clinic systolic BP <130 mmHg, ambulatory BP ≥130 mmHg) were less likely to find masked hypertension, compared with studies that used a more liberal criterion (clinic systolic BP <140 mmHg, home BP ≥130 to 135 mmHg). The thresholds for classification of clinic and out-of-office hypertension were heterogeneous (Table 2). Masked hypertension was defined as clinic BP of <130 mmHg and ambulatory BP ≥130 mmHg in two studies (17,18), clinic BP of <140 mmHg and home BP ≥130 mmHg in two studies (14,15), and clinic BP of <140 mmHg and home BP ≥135 mmHg in two studies (13,16). One study (16) measured home BP in triplicate, twice daily for 4 d, whereas others measured it over 2 wk to 1 mo but only in the morning (13–15). The provenance of heterogeneity was explored by analyzing the studies by various definitions of masked hypertension used by the authors. If patients with CKD and with clinic BP <140 mmHg but ≥130 mmHg by out-of-office BP are considered to have masked hypertension, then such patients are more likely to be classified as having masked hypertension compared with patients with clinic BP <130 mmHg but ≥130 mmHg by out-of-office BP. The prevalence of masked hypertension in studies that used the stricter definition (clinic <130 mmHg, out of clinic ≥130 mmHg) was 5.3% (95% CI 3.4 to 7.2%) compared with 19.8% (95% CI 16.1 to 23.6%) in studies that used the more liberal (clinic <140 mmHg, out of clinic ≥130 mmHg) definition (overall test of heterogeneity between subgroups 45.3; P < 0.001; Figure 2). Of note, there was still a large amount of variability in the prevalence of masked hypertension in studies that used the more liberal definition of masked hypertension. This may have been related to no exposure to antihypertensive drugs in the study of Matsui et al. (16), in contrast to between 90 to 100% prevalence of antihypertensive drug use in other studies. The prevalence of white-coat hypertension from the individual studies ranged from 10.5 to 31.7%. The average weighted prevalence of white-coat hypertension from all studies was 18.3% (95% CI 15.9 to 20.7%; Figure 4). Among patients who had hypertension on the basis of clinic BP, the prevalence of white-coat hypertension was 30.0% (95% CI 26.5 to 33.5%; Figure 5). There was substantial heterogeneity between studies (I2 statistic 74.3%). No one study was influential. Forest plot shows the prevalence of white-coat hypertension. When studies were divided on the basis of the criteria used for diagnosis of white-coat hypertension, it was found that studies that used a more strict criterion (clinic systolic BP ≥130 mmHg, ambulatory BP <130 mmHg) were more likely to find white-coat hypertension, compared with studies that used a more liberal criterion (clinic systolic BP ≥140 mmHg, home BP ≥130 to 135 mmHg). Forest plot shows the risk ratio of masked hypertension (among clinic normotension) to white-coat hypertension (among clinic hypertension). The risk for white-coat hypertension was greater in studies that used a more strict criterion to diagnose masked hypertension (clinic systolic BP <130 mmHg, ambulatory BP ≥130 mmHg). The risk for masked hypertension was greater in studies that used a more liberal criterion to diagnose masked hypertension (clinic systolic BP <140 mmHg, home BP ≥130 to 135 mmHg). The provenance of heterogeneity was explored by analyzing the studies by various definitions of white-coat hypertension used by the authors. The prevalence of white-coat hypertension in studies that used the ambulatory BP–guided definition was 28.3% (95% CI 24.4 to 32.1%) compared with 11.7% (95% CI 8.6 to 14.9%) in studies that used the more strict definition (Figure 4). Of note, there was still a large amount of variability in the prevalence of white-coat hypertension between studies using the more liberal definition of white-coat hypertension (I2 statistic 69.8%). This may have been related to measurement methods (e.g., Andersen et al. measured BP in both arms in the clinic and used the higher of the two measurements as the clinic BP, whereas Minutolo et al. did not), true difference in prevalence, or other factors. Given the information in the previous paragraph, it is likely that definitions that are used to classify patients as having masked hypertension or normotension are likely to influence the risk for being classified as having masked hypertension when patients have normal clinic BP compared with the risk for being classified as having white-coat hypertension when they have elevated clinic BP. Figure 6 illustrates that the definitions that are used to classify patients as having hypertension or normotension indeed can influence the risk for being classified as having masked hypertension compared with white-coat hypertension. When the thresholds for classification of clinic and ambulatory BP are equal, the risk for diagnosis of masked hypertension is less: Risk ratio 0.74 (95% CI 0.53 to 1.04). When the clinic BP can be higher and home BP lower, the risk for the diagnosis of masked hypertension is greater: Risk ratio 1.36 (95% CI 1.08 to 1.70), overall test for heterogeneity between subgroups 21.2 (P < 0.001). Forest plot shows that the definitions that are used to classify patients as having hypertension or normotension indeed can influence the risk for being classified as having masked hypertension compared with white-coat hypertension. When the thresholds for classification of clinic and ambulatory BP are equal, the risk for diagnosis of masked hypertension is less: Risk ratio 0.74 (95% CI 0.53 to 1.04). When the clinic BP can be higher and home BP lower, the risk for the diagnosis of masked hypertension is greater: Risk ratio 1.36 (95% CI 1.08 to 1.70), overall test for heterogeneity between subgroups 21.2 (P < 0.001). In patients with masked hypertension, early studies suggested greater prevalence of target organ damage (19). Subsequently, it was discovered that in patients with essential hypertension, masked hypertension was also associated with poor outcomes (20). A recent meta-analysis noted that cardiovascular events and mortality both are elevated in patients with masked hypertension detected by self-measured BP (8). In a small and only study in patients with CKD, masked hypertension increased the chances of ESRD compared with those with truly normal BP, and those with white-coat hypertension had lower risk for ESRD compared with patients with persistent hypertension (11). In this meta-analysis, we found that in patients with CKD, the overall prevalence of masked hypertension was approximately 8% and of white-coat hypertension was approximately 18%. Perhaps more alarming, one third of patients who had CKD and were thought to have normotension (or adequately treated hypertension) in fact had hypertension at home. Also, approximately one third of patients who had CKD and were thought to have hypertension (or inadequately treated hypertension) in fact did have normotension at home. Thus, clinic BP measurement leads to substantial misclassification in BP. Another important finding of our study was that the definitions that are used to classify patients as having hypertension or normotension can influence the risk for being classified as having masked hypertension compared with white-coat hypertension. We found that when the thresholds for classification of clinic and ambulatory BP are equal, the risk for diagnosis of masked hypertension is less (risk ratio 0.74). When the clinic BP threshold is higher and home BP threshold is lower, the risk for the diagnosis of masked hypertension is greater (risk ratio 1.36). These data also suggest that true prevalence of well-controlled hypertension is greater in patients with CKD than what is currently estimated from clinic BP measurements alone. As a direct example, in one study, adequate systolic BP control (<130 mmHg) was seen only among 19% of patients with CKD with clinic BP but doubled to 38% when ABPM was performed for the same patients (18). There was a notable heterogeneity in prevalence of masked hypertension between studies that is unlikely to be a result of the variations in the technique of out-of-office BP measurements whether they are performed by self-measured or automatic ambulatory measurements (21). The heterogeneity may be better explained by the cutoffs used to define normal and abnormal BP. In this context, hypertension in patients with CKD poses a dilemma. Because clinic BP is targeted to <130/80 instead of <140/90 mmHg in those with essential hypertension and because hypertension is more difficult to control in those with CKD, fewer patients with CKD are classified as having normotension. If the thresholds that are used to diagnose hypertension control in CKD are those recommended for essential hypertension, then the prevalence of well-controlled hypertension in clinic should increase, which may also inflate the prevalence of masked hypertension. In fact, in a recently reported meta-analysis, the prevalence of masked hypertension in patients with essential hypertension was found to be 16.8% (95% CI 13.0 to 20.5%). When we used definitions to diagnose masked hypertension that are used in the general population, our results found a similar prevalence of masked hypertension (19.8%; 95% CI 16.1 to 23.6%); however, using CKD-specific thresholds lowered the prevalence of masked hypertension to 5.3% (95% CI 3.4% to 7.2%). Thus, patients with CKD may have a prevalence that is similar to what has been reported in the general population, but this depends largely on the definition. 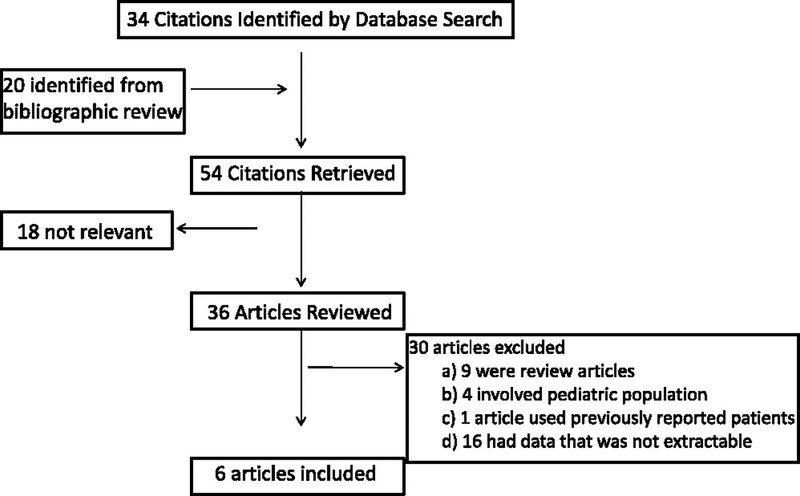 The meta-analysis of Verberk et al. (21) in the general population included studies that excluded patients with poorly controlled clinic hypertension, which may have inflated prevalence estimates. Our data provide support for the notion that the true prevalence can be reliably estimated only by including patients with CKD regardless of BP control. Excluding patients with hypertension will inflate estimates of the prevalence of masked hypertension. The prevalence of white-coat hypertension in the population without CKD was reported to be 21% among patients with clinic diastolic BP persistently between 90 and 104 mmHg (6). Among patients with hypertension in the clinic, we found a prevalence of 30.0% (95% CI 26.5 to 33.5%), which is at least as high as seen in the population without CKD. Some recommendations for more uniform reporting of masked and white-coat hypertension can be formulated on the basis of this review. Hypertension treatment for patients with CKD is guided by clinic-measured BP, and guidelines call for targeting this BP to <130/80 mmHg. Similar guidelines for ambulatory BP are not available; however, some information can be derived to target ambulatory BP from the international collaboration of investigators that led to analysis of pooled data in normal individuals and patients with essential hypertension in several countries to calibrate the BP level using ABPM that is associated with optimal, normal, or hypertensive clinic BP (22). From these investigations, the threshold BP that would correlate with cardiovascular mortality rate similar to BP thresholds of <130/80 mmHg would be 125/75 mmHg for 24-h recording, 130/80 mmHg for daytime recording, and 110/65 mmHg for nighttime recording. Because the diagnoses of masked and white-coat hypertension are made during the day, considering a daytime threshold of ≥130/80 mmHg in patients who have CKD and are not on dialysis seems appropriate. Keeping in mind these considerations, the exact methods of measurement of clinic and out-of-office BP should be specified by investigators. In fact, simply taking “usual” BP recordings in the clinic and comparing them with standardized measurements of BP can dramatically alter the prevalence estimates of white-coat and masked hypertension (18). Investigators should report the absolute BP and their SD and the differences in BP and the SD of the differences obtained in the office and out of office. This will allow better estimation of the magnitude of masked hypertension effect and white-coat effect in patients with CKD. What is unclear from these studies of patients with CKD is whether masked hypertension is a chance finding or a reproducible phenomenon. Whether patients who have masked hypertension on one occasion will have the same diagnosis when repeatedly studied should be evaluated in future studies. The causes that underlie masked hypertension remain obscure. The samples that were used in this analysis were for the most part clinically diagnosed patients who had hypertension and were receiving treatment. This sample would be biased in favor of diagnosing white-coat hypertension. 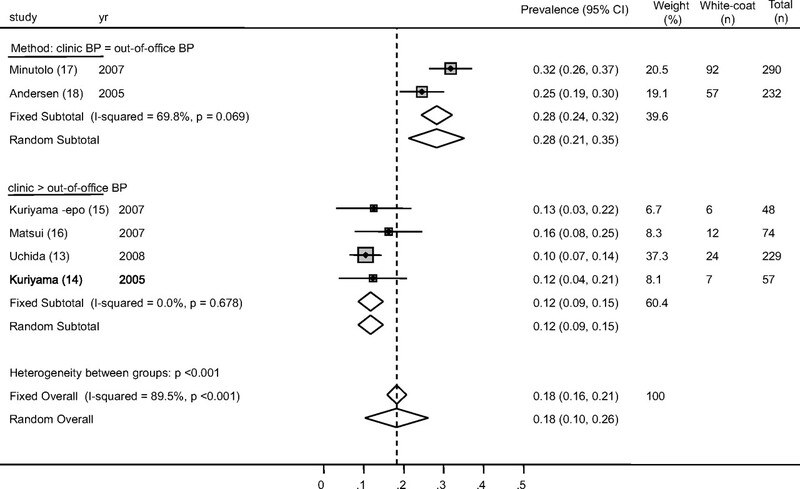 For better defining the prevalence of masked hypertension, representative samples of the population with CKD without regard to office-based BP status (and thus including office-based patients with normotension) should be studied in the future. More research is needed to ascertain the clinical significance of masked hypertension and white-coat hypertension in patients with CKD. The results of this study may have therapeutic implications, because patients with white-coat hypertension may be overtreated and those with masked hypertension may not be treated enough. Because a large number of patients may be left untreated (masked hypertension) or treated too aggressively (white-coat hypertension), a simple yet effective strategy and one supported by the American Heart Association is to monitor home BP to assess BP control (23). 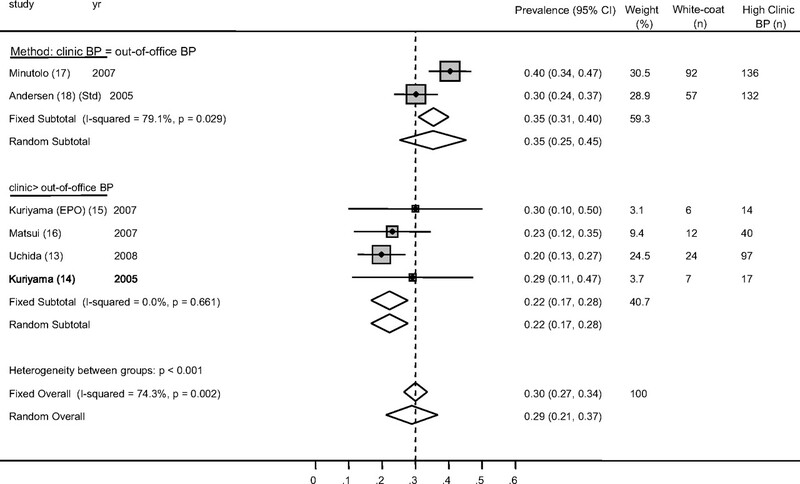 Home BP monitoring can improve achievement of BP targets (24). Although home BP monitoring is an excellent tool to detect and manage hypertension, it cannot rule out masked hypertension or white-coat hypertension. Physical activity can have a powerful effect on BP, especially in patients with CKD, who are more sedentary, and those who are not treated with antihypertensive drugs (25). Circadian rhythms can be identified only with ABPM. Thus, for research purposes, ABPM remains a reference standard. This study was supported by a grant from the Veterans Administration Merit Review. Epidemiology of Chronic Kidney Disease Among Normotensives: But What Is Chronic Kidney Disease?